The first cells were the ones that had a collection of proteins and nucleic acids that gave a better chance to not be destroyed. Somehow, the nucleic acids became encoded to represent the specific amino acids in the cell. This is to say that the pattern of the early RNA gave a set of “instructions” so that the amino acids would arrange in a particular order. We still have no idea how this encoding process occurred, but it is important to remember that a gap in our knowledge does not disprove what we already know. The cells that were in the best circumstances with the most beneficial amino acids were able to form structures, both within the cell along the outside. These cells were still working with randomness while mutations to the encoded RNA allowed the offspring to diversify slightly from the parent. Tons of these cells formed but tons of them were poorly suited for their environment and died. We are going focus on the cells that made it. The first cells likely maintained genetic material in a circular form called a plasmid that could be cut open by an enzyme, copied, and then resealed. The individuals that wrapped their RNA in a circle had a lower chance of genetic damage. Because of this advantage, all descendant cells took on this characteristic. We still see plasmids today, though only in single celled organisms. The reactions that take place within the cell are collectively called the metabolism. Most early reactions were either energetically favorable to occur or facilitated by proteins that held molecules in place long enough for the reaction to occur. Reactions would randomly occur, but cells that were able to store absorbed energy in easily breakable molecules were more likely to survive and pass down the traits. Early processes included reactions like photosynthesis. Carbon dioxide and water, two compounds in large excess environmentally, are converted into a stable yet energetically dense molecule that resembles modern sugars. To store that much energy, the cells first had to absorb that energy from the photons coming from the sun. Oxygen gas was a byproduct of this reaction. A coupled reaction would break down the newly formed sugar in order for the cell to use the stored energy when necessary. Even more complex processes used many enzymes but lowered the overall energy. Living things found a way to build up energy in more complex forms but even they had to obey the laws of energy; they could not just take and take. In the beginning, cells were small enough to diffuse gases through their membrane based on the concentrations in and out of the cell. As the cells grew larger, proteins with channels formed within the membrane to allow for larger molecules to pass. Other structures eventually grew in and on the membrane. Proteins that grew outward from the membrane could serve the purpose of movement or defense to survive in the harsh environment. The outward movement of proteins is a process that is repeated throughout living organisms. If you look at a leaf or a mushroom cap or a fin you see that it is formed by a spreading of proteins outward while maintaining energetic stability. We find math in nature because everything must follow the laws of energy. Larger cells face the problem of transporting molecules throughout the cell. Proteins with branching structures developed to grab hold of large molecules or structures and “walk” them to the required place. The walking proteins are called kinesin and its structure allows each “foot” to temporarily bind with a structural support of the cell. Some cells eventually grew large enough to absorb smaller cells, enveloping them in a membrane within the larger cell. We call this inner membrane a vacuole. Those cells could change the pH in the vacuole to optimize the function of enzymes to break down the smaller cells and steal their sugars, lipids, and proteins for their own use. 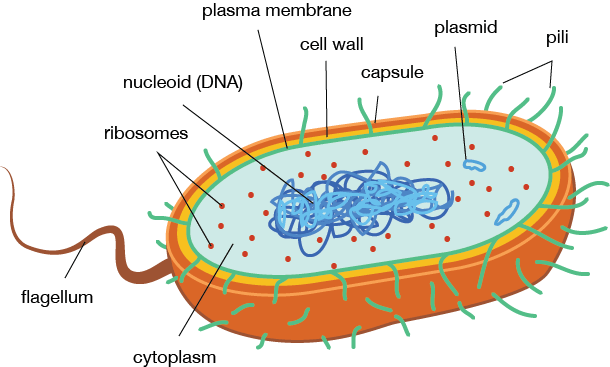 The process of a larger cell enveloping a smaller cell into a vacuole is called phagocytosis and it was the first form of eating. This was a hugely advantageous adaptation because it meant that cells didn’t have to harvest their energy from the environment. Instead, they could steal the energy harvested by other cells. This began the world of predators and prey and progress leaped forward. Not only did cells have to survive their environment, now they had to avoid being eaten! Diversification allowed the best adapted organisms to survive and pass on their traits. Organisms developed methods of escape and defense to stay alive as well as the adaptations that occurred within the cell. It was only the organisms that were able to allocate resources most effectively that survived and passed down their traits. Having a random advantageous mutation could be quite helpful. The relatively few cells that were able to adapt to their environments were, by all definitions, the winners. This means we come from a long line of winners! The individuals that survived and thrived in their environment gave rise to more organisms that found a way to do the same. The story of evolution isn’t just a description of where we came from, it can also be an uplifting realization! You are alive today because your ancestors kept on adapting and getting better. It’s up to us to keep that tradition going within ourselves: always getting better!